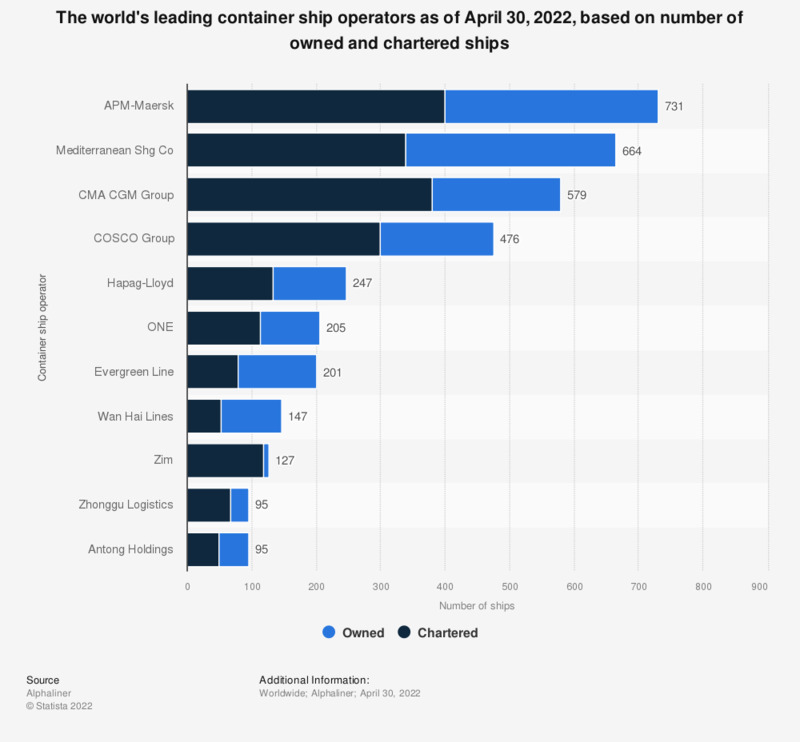 This statistic displays the leading container ship operators worldwide as of March 27, 2019, based on the number of ships in their fleets. With 708 ships, AP Moeller-Maersk was ranked first. In terms of capacity, the world's largest container ship operators include France's CMA CGM, Swiss-based Mediterranean Shipping Company and Denmark's Maersk Line. After an alliance between these three companies was nixed by antitrust watchdogs, a partnership between MSC, Hyundai M.M. and Maersk was approved in 2016. Copenhagen-based AP Moeller-Maersk was founded in 1904. While Maersk is active in various fields, the company’s largest business area is the container shipping area, which operates under the Maersk Line unit. In 2017, Maersk generated around 31 billion U.S. dollars in revenue, some 24.3 billion U.S. dollars of which were derived from the group’s Maersk Line segment. As of March 5, 2019 Maersk’s container ship fleet had a capacity of around four million twenty-foot equivalent units of capacity. Furthermore, the container line had ships with an additional 34,160 twenty-foot-equivalent units of capacity in its order book. One of Maersk’s most impressive container ships is the Magleby Maersk. The Triple-E vessel was built by South Korea’s Daewoo Shipbuilding & Marine Engineering Company, one of the largest shipbuilding companies worldwide. The gargantuan cargo ship is 400 meters long, 59 meters wide and 73 meters high. The ships in the triple-E class are at the vanguard of a trend towards increasingly larger ships, although the container shipping-industry continues to suffer from overcapacity and weak global demand. Hamburg Süd was acquired by APM Maersk in 2017 to power Maersk Line's growth strategy looking forward.